The US economy continues moving forward! Despite the political winds of change flowing throughout the halls of Congress and the Federal Reserve Bank's efforts to reduce its balance sheet, the economy continues to move forward. A further rate hike appears to be postponed due to concerns about the economy. For the past 115 months, the market has not seen a real down period. However, it has become more volatile thanks to computer programs attempting to skim a few cents off a trade as each news item moves the market. Unemployment continues below 4% as counted by the government and women, African-American and Hispanics are at record low levels. The real problem is with those individuals who have not been able to adapt to the changing requirements of the workplace. Technology and robotics have combined to reduce in many work environments, the requirement for personnel. While the U.S. economy continues to move forward that is not the case in most of the rest of the world. Tariffs on Chinese imports are beginning to cause strains in the Chinese financial system. Leverage on debt to GDP in China is beginning to be worrisome to many investors particularly as the legal system within China can change almost overnight. 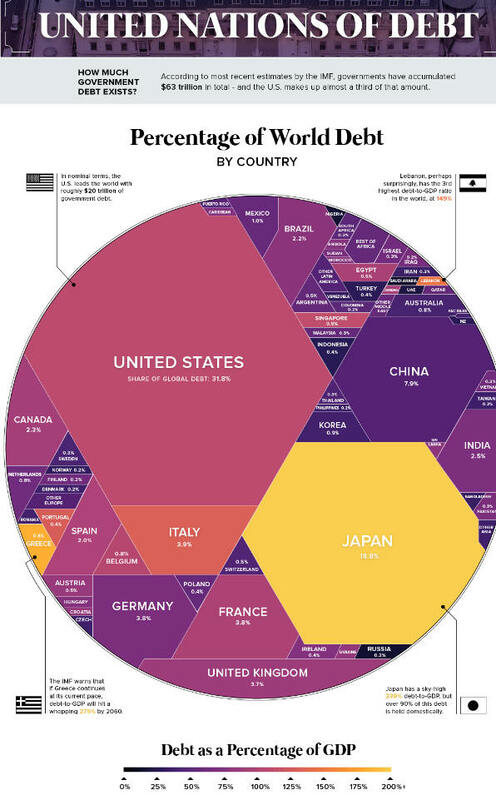 World-wide debt continues to grow while several European countries are facing economic slowdowns and Italy is really facing bankruptcy. According to the IMF, the U.S. has accumulated $20 billion of the $63 billion of World Debt as shown in the following chart. The real problem is that the GAAP report for FY 2017 for the U.S. shows about $45 trillion of debt on a discounted cash-flow basis but no where in the report is the discount rate shown. Political upheavals in not only South & Central America are raising the spectacle of financial insolvency in Venezuela, Brazil and Argentina. The China debt is understated by about 7 times as it does not include that of the state-owned industries. Despite the surge of immigrants trying to gain entrance to the U.S., many politicians are demanding that immigration laws be abandoned. For the past decade, politicians and immigration activists have tried to tell us that there were only 10 or 12 million illegals in the U.S.
A new Yale study, using mathematical modeling on a range of demographic and immigration operations data, suggests that the population of undocumented immigrants in the United States may be more than 22 million—more than twice what was previously believed. But don't worry they won't vote. Politicians rarely understand the demographic changes that illegal immigration will bring to the nation in two generations largely caused by the differential in birth rates. The real question is who is the ultimate buyer of debt and is the cash really available to meet all the debt obligations in not only the U.S. but throughout the world. At what point does the U.S. dollar lose its position as the world's reserve currency? For that is when the dam will break. Keep It Safe, Simple and Stay Focused! But then 'Tis Only My Opinion! This issue of 'Tis Only My Opinion was copyrighted by Strategic Investing in 2019.